Woohoo! 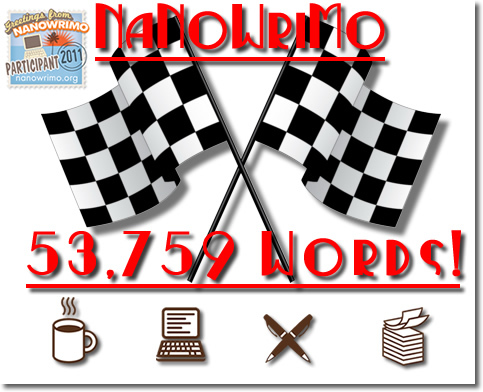 I’ve broken through the 50,000 word challenge for NaNoWriMo! After a few days away I had a huge burst of writing madness and finished today’s total at 53,759 words as part of my NaNoWriMo novel. I still have a while to go before I actually finish my novel, I estimate around another 40,000 words or so. I’m loving every moment of it so I want to keep up the momentum and finish my novel before November 30th. I’m rooting for everyone to keep churning out their novels – don’t stop, keep going! Huge grin on my face this evening!! ← The Kitchen Table Project – What does your kitchen table say about you? wow that’s amazing! you have me pulling up my eyebrows and grrreeeeeen with envy!!! I hope it’s something of an inspiration for you! Not surprised at the least. Team Indy said you were going to finish within the first two weeks. Big, BIG congratulations! Wooot wooot!!! Way to go Dave! Thanks Indigo! Whilst the prospect of tapping out 50,000 words was indeed challenging, my real aim is to finish the story before the end of the month. I knew before I started that I had a lot of content and plot to get through and 50k wasn’t enough room to do it. I’m pushing on and with a bit of luck I’ll be finished by Nov 30th. It’ll be interesting to see the total combined word count for NaNoTeamIndy at the end! That is fantastic Dave…well done…I take off my proverbial hat to you! Thanks Granny! I’m all smiles today! Lovin your recent beach photos by the way! Stunning stuff!